Here in Fort Lauderdale, there are so many ways to get around! Locals and visitors alike cruise the city aboard yachts, jet skis, airboats, Segways, bicycles, skateboards and more. One of the most unique modes of transportation available here is a gondola! Aboard this Venetian vessel is a perfect way to see the city of Fort Lauderdale, which consists of countless Intracoastal Waterway canals. We compiled the three best places to try a gondola ride in Fort Lauderdale! Before embarking on a gondola ride in Fort Lauderdale, be sure to try some of the area’s other amazing activities! Here in “The Venice of America,” you can soak up the sun at one of our many beaches, enjoy a festive seasonal event, or visit one-of-a-kind local boutiques. Whatever you’re looking to do, our complimentary Fort Lauderdale Vacation Guide can help you plan the details! It’s the area’s best resource for hand-picked dining, shopping, and adventuring recommendations. Request access today! A gondola is a centuries-old means of transportation traditionally used in the canals of Venice, Italy. The unique, canoe-like boats are propelled by a gondolier, who uses a rowing oar. Even though gondolas have been in use since medieval times, variations are still used in lagoons and canals all over the world for public transportation and recreational tours. Here in Fort Lauderdale, gondolas are larger and more elaborate than traditional versions. They offer a perspective of “The Venice of America” that you’ve never before seen! Las Olas Gondola, Inc. offers one of the most memorable gondola rides in Fort Lauderdale! This 15-year-old company is ideal for romantic excursions and proposals, but is kid-friendly if you want to bring the family along for the ride. Prepare to be charmed as you glide through the glistening waters of Las Olas for a total of 75 minutes! Your gondolier will be located in the back of the boat playing mood music, and you’ll enjoy your own private cabin in the center of the boat. Glasses, ice, and plates are included for guests who want to bring their own refreshments. Another perk of touring with Las Olas Gondola? You can opt to include a message in a bottle and a rose for surprising your sweetheart. This company operates rain or shine, seven days a week. Gondolas West in Fort Lauderdale offers another one of the area’s best rides! This company is a great choice for environmentally conscious folks seeking a tranquil, nature-centric ride through the city’s most intimate channels. Instead of touring past manmade mansions and yachts, Gondolas West takes groups of up to six people through serene areas draped with tropical foliage. The boats themselves are virtually silent and emissions-free, and offer plenty of comfortable seating space. At the center of the boat, there’s even a table with cupholders! Tours of varying durations can be reserved through the Gondolas West Booking Calendar. Embark on a Riverfront Gondola Tour and experience Fort Lauderdale’s many breathtakingly beautiful sights. On one of these gondola rides, you’ll encounter waterfront homes, large yachts, and native wildlife like iguanas and manatees! This company’s eco-friendly, electric boats hold six people. Complimentary cold water and tableware are also provided. Another defining feature of Riverfront Gondola Tours is their seasonal offerings. During the holiday season, be sure to go on a Christmas Light Tour to see all of the city’s stunning holiday lights! Stay Near All of the Best Attractions in Fort Lauderdale! 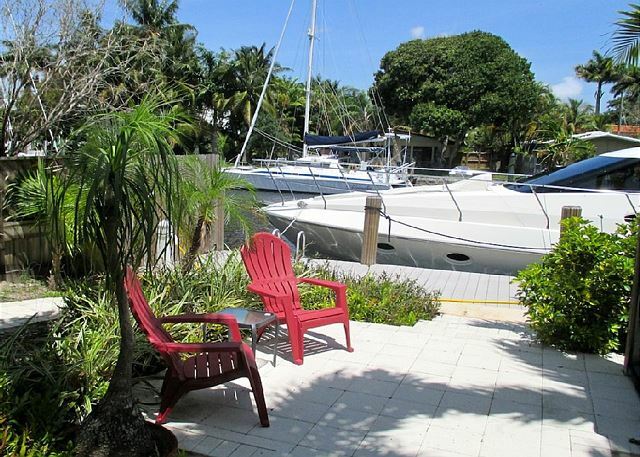 After experiencing an amazing gondola ride in Fort Lauderdale, come back to comfort and luxury at your very own Fort Lauderdale Stays vacation rental. Our immaculately clean and fully stocked rentals are perfect for romantic getaways, family vacations, and even business trips. Whatever your reason for visiting beautiful Fort Lauderdale, know that you’ll be taken care of when you stay in any of our Las Olas, Fort Lauderdale Beach, Imperial Point, Wilton Manors, or Poinsettia Heights homes. Many of our rentals are even pet-friendly! Ready for the tropical trip of a lifetime? Book your gondola ride in Fort Lauderdale, then reserve your perfect home away from home today! We look forward to hosting you in “The Venice of America” very soon!